Quick overview Offers us a glimpse into the life and mind of Medieval England. This is a masterly collection of chivalric romances, moral allegories and low farce. 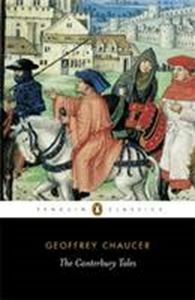 Inspired by Boccaccio's "Decameron", and framed as a storytelling competition between a group of pilgrims, Geoffrey Chaucer's "The Canterbury Tales" is one of the greatest works of English literature, translated from the Middle English with an introduction by Nevill Coghill in "Penguin Classics". In "The Canterbury Tales" Chaucer created one of the great touchstones of English literature, a masterly collection of chivalric romances, moral allegories and low farce. A story-telling competition between a group of pilgrims from all walks of life is the occasion for a series of tales that range from the Knight's account of courtly love and the ebullient Wife of Bath's Arthurian legend, to the ribald anecdotes of the Miller and the Cook. Rich and diverse, "The Canterbury Tales" offers us an unrivalled glimpse into the life and mind of Medieval England. Nevill Coghill's masterly and vivid English verse translation is rendered with consummate skill to retain all the vigour and poetry of Chaucer's fourteenth-century Middle English. Geoffrey Chaucer (c.1343-1400) was an English author, poet, philosopher, courtier and diplomat, best known as the author of "The Canterbury Tales". Chaucer is credited as being the first author to demonstrate the artistic legitimacy of the vernacular English language. The first poet to have been buried in the Poet's Corner of Westminster Abbey, his other works include "The House of Fame", "Troilus and Criseyde" and "The Book of the Duchess". If you enjoyed "The Canterbury Tales", you might like Boccaccio's "Decameron", also available in "Penguin Classics". "Nevill Coghill's easy, seductive translation ensures that this, the most popular work in English Literature - now 600 years old - will run through yet more centuries, delighting yet more readers, shaping more writers". (Melvyn Bragg).